The birds are singing and the flowers are bloomin’ - that means it’s time for the Spring Pinterest Challenge! Today I’m joining Katie, Sherry, Emily and Renee in their challenge to stop pinning and start doing! 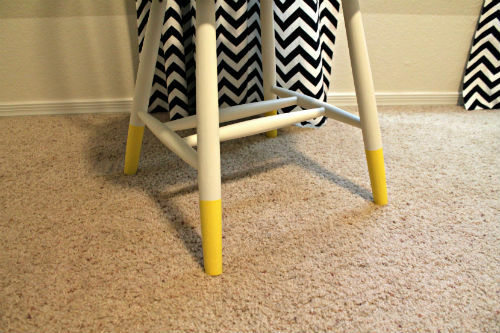 I have almost 200 pins on my DIY Ideas board, so narrowing it down to one was tough. I decided to go with a project that’s featured a few different times in a few different ways on my board. The paint-dipped look! I also went with this idea because I already had everything on-hand for this project, so it was FREE! My favorite kind of project! 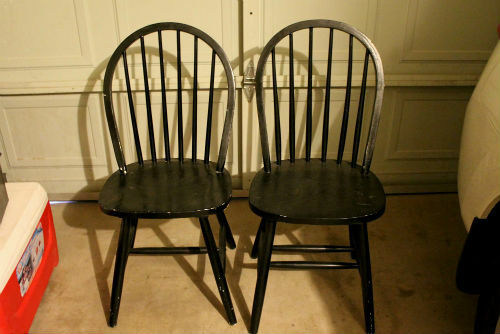 I started with these two chairs that I found on the curb while walking Ringo and Abby. See, it pays to take the dogs out and get some exercise! They were in good shape except for the scratched and peeling paint. I stripped off as much of the black paint as I could and sanded down the rest. 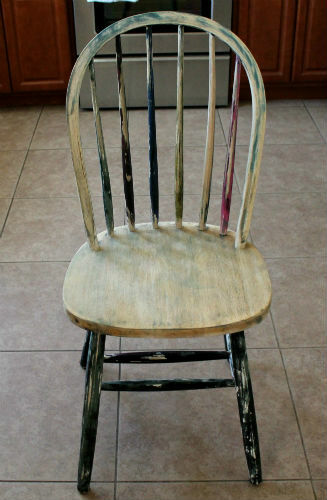 As you can see, the chairs were painted a rainbow of colors under that black paint. This is where chairs become chair in this story because this is as far as I got with the other chair. 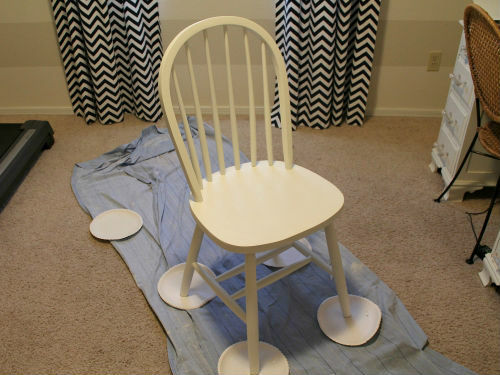 I tried to spray paint the chair, but it was taking WAY too much paint, so I ended up using a brush and small roller instead. 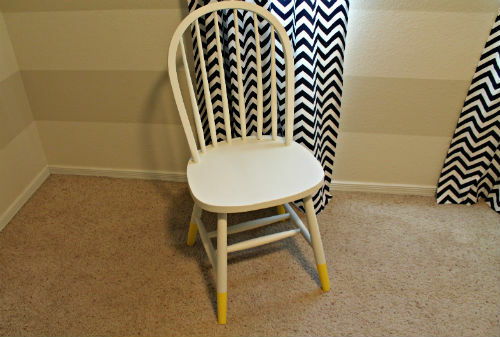 I used some leftover Creamy by SW to paint the chair white. It already looks so much better! And now for the finishing touch! I measured 5” from the bottom of the leg all the way around and taped it off. I used my painting trick of sealing the edges of the tape with the original color (to prevent bleeding) on each of the legs. I still have to finish the second chair and then we can use them as our desk chairs in the office! 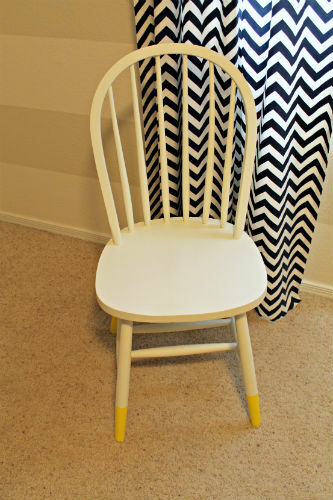 I originally planned to buy chairs, but you can beat free paint-dipped chairs! 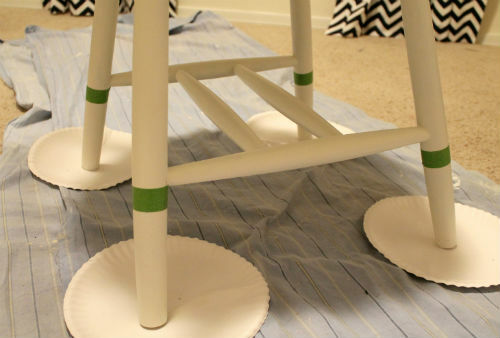 Oh, and don’t forget to check out Katie, Sherry, Emily, and Renee’s Pinterest Challenge projects!